A: Flax is a blue-flowered plant grown in the cool, northern climate of the western Canadian prairies and northern United States. It can be consumed in whole seed, milled, or oil form. It is a powerhouse of disease-fighting compounds, such as the omega-3 fatty acid alpha-linolenic acid (ALA), fiber, and lignans (which are powerful anti-oxidants) that researchers have found helpful in preventing heart disease, protect against inflammatory disorders and certain cancers, and lower your cholesterol. Flax adds flavor, nutrition, and health benefits to a variety of foods and has a mild, nutty flavor. A. Golden and brown flax both contain the same nutritional benefits in terms of omega-3 fatty acids, lignans, protein and dietary fiber. It's a matter of choice but rest assured that you can substitute golden for brown and vice versa without sacrificing any of the natural goodness in flaxseed. Q. I've heard I need to grind whole flax. Why is that? A. While whole and ground flax have the same nutritional content, your body gets far more benefit from ground flax. That's because the goodness in flax is wrapped up in a hard, shiny seed coat that's hard to crack, even with careful chewing. Grinding or roasting flax breaks this seed coat making all the nutrients easy to digest. Flaxseeds are easy to grind at home using a coffee grinder, food processor or blender. You also can buy ground or "milled" flaxseed in most stores where whole flax is sold. A. Yes. 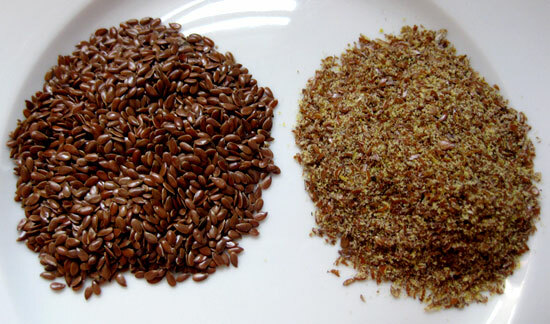 Flaxseed oil is the result of cold-pressing flaxseeds. Because it is the fat portion of the seed, it contains high levels of omega-3 ALA — almost eight grams per tablespoon. But flaxseed oil doesn't have the fiber, lignans, and protein found in the rest of the seed. A. If you buy whole flaxseed, don't be afraid to keep a jar of it handy on your kitchen counter. Whole flaxseed is naturally wrapped in a perfect package — a hard hull that preserves it's goodness for up to a year or longer. Ground flaxseed is best stored refrigerated in an opaque container and will keep at least 90 days. Because ground flaxseed flows readily even when frozen, many users choose to store ground flaxseed in the freezer for even longer shelf life. Others simply grind flaxseed as they use it to ensure utmost freshness. Roasted flaxseed should also be refrigerated or frozen. Flaxseed oil should be refrigerated and usually has an expiration date about four months after pressing. Q: How much flax do I need each day? A: To get the full health benefits of flax, we recommend one to two tablespoons (16g) of ground or milled flax. When using ground flax, because of its high fiber content, add it slowly, starting with about a tablespoon a day and working up to two or more per day. A. Flax is a natural plant source of vital nutrition and is considered safe for healthy people of all age groups. We recommend no more than one-quarter tablespoon daily for young children. Q: What is flaxseed oil? A: There are two types of flaxseed oil available — conventional and organic. These types of flaxseed oil differ in the way in which the seed is grown. Flaxseed oil results from pressing the oil from the seed. Flaxseed oil provides more ALA (approximately 55-58 percent) on a per weight basis in comparison to whole or milled seed (approximately 18-23 percent). Q: What are the health benefits of flax? A: Flax contains several disease-fighting compounds, primarily the omega-3 fatty acid, alpha-linolenic acid (ALA), fiber, and lignans. Flaxseed is one of the richest sources of ALA, a polyunsaturated fat that offers unique heart health benefits. Flax is an excellent source of both soluble and insoluble fiber, providing three grams of fiber per tablespoon. Flax also is packed full of lignans, natural cancer-preventative phytonutrients. Flax also is full of vital vitamins and minerals such as folate, vitamin E, vitamin B-6, copper, zinc, magnesium, and (dry ounce for ounce) more potassium than seven bananas. Flax has been shown to help prevent heart disease and lower its risk factors, reduce symptoms of inflammatory disorders, protect against cancer, reduce cholesterol, and even ease the effects of Type 2 diabetes. Learn more about the health benefits of flax and make it an important part of your daily diet. A. The majority of U.S. diets no longer contain the amount of omega-3 fatty acids needed for overall health and wellness. Omega-3 fatty acids correct imbalances in modern diets that lead to health problems. Today, Americans are consuming more than 10 times as many omega-6 fatty acids (another essential fatty acid family which is required by the body in moderate, not excessive, amounts) as they are omega-3 fatty acids thanks to the increase of fatty, highly processed foods in today's diet. Eating less omega-6 and more omega-3 fats from foods like ALA-rich flax can help lower the risk of chronic diseases like heart disease, stroke, and cancer, as well as lower LDL or "bad" cholesterol. In fact, large scale studies confirm that plant-derived omega-3's offer unique heart-healthy benefits and may be even more effective than fatty fish and fish oils in lowering the risk of some coronary diseases. Recently, scientists have discovered that flax may play an important anti-inflammatory role in reducing immune system diseases. Flax ALA has been shown to lower blood levels of a compound called C-reactive protein or CRP. Reducing this inflammatory compound appears to be as important as lowering LDL cholesterol in preventing heart attacks and strokes. A. Lignans are natural antioxidants that reduce the activity of cell-damaging free radicals, slow the aging process, and increase overall wellness. Flax contains up to 800 times more lignans than other plant sources, such as whole grains and legumes. Besides acting as antioxidants, lignans are phytoestrogrens — active substances derived from plants that mimic the action of estrogen hormones in the body. Research continues to show their potential for treating menopausal symptoms without traditional drugs and reducing the risk of hormone-sensitive cancers of the breast, prostrate, and endometrium. Lignans are especially important for women as studies have shown them to decrease the risk of breast cancer, as well as minimize cancer symptoms and reduce the spread and growth of breast cancer after diagnosis. Lignans also possess powerful antioxidant and anti-inflammatory properties associated with a lower risk of artery-clogging plaques and diabetes. Lignans have also been found effective in lowering the risk of type 1 and 2 diabetes. Q. What's the difference between omega-3 fatty acids from flax and those found in fish oil? A. Flax is very high in the omega-3 fat ALA (alpha-linolenic acid). This is the "essential" omega-3 fat because our bodies need it to be healthy. However, because our bodies don't produce it, we must consume it from other sources, like flax. Other omega-3 fats, EPA (eicosapentaenoic acid) and DHA (docosahexaenoic acid), found in fatty fish, are vital for health, but not "essential," because our bodies can make them from ALA. All of these omega-3 fatty acids help decrease inflammation, which is a trigger for heart disease, diabetes, cancer, and arthritis. Flax is unique in that it also is a rich source of lignans, phytoestrogens that may reduce risk of cancer, as well as a rich source of fiber, which lowers cholesterol and maintains digestive health. Although fish doesn't have these benefits, it is a good source of protein. Fish can contain traces of mercury, and the FDA advises women who are pregnant, nursing, or may become pregnant, as well as young children, to avoid eating certain fish. Q: How does flax benefit athletes and sports training? A: Omega-3 fatty acid alpha-linolenic, ALA, an essential fatty acid found in flax, improves the metabolism of fats which is especially helpful with endurance sports, such as marathons. When a runner "hits the wall" and their glycogen stores are used up, the body begins burning fats. In this case, efficient burning of fats makes a difference in performance. ALA improves response time. Electrical impulses move from the brain to muscles across cell membranes which, as indicated earlier, are rich in ALA when consumed in the diet. Omega-3 fatty acids, such as ALA, are the most efficient fatty acids in allowing these electrical impulses to move from cell to cell. Thus, response time is improved. ALA aids in muscle repair at the cellular level. Omega-3 fatty acids present on the cell membrane significantly affect the speed and quality of tissue repair. Q: Why is flax important to skin health?